London and Boston are leading this summer’s workout + mimosas charge. The Yoga Brunch Club is far from the only game in London town, though. Equinox Kensington, for example, partnered with the Mondrian hotel last year to host a series of rooftop fitness events that culminated with avocado on chia seed soda bread and bubbly. This summer, they’re teaming up again, offering boxing brunches, barre burn brunches, and hip hop yoga brunches. “This long-embraced trend is evidence that health and fitness as a lifestyle is thriving in London,” says Hannah Macey, a spokesperson for Equinox. In fact, Macey adds that these types of events are a huge driver behind London’s social scene. Rather than late-night workouts followed by a few pints at the local pub, fit Brits are opting for daytime activities that only sometimes include alcohol. 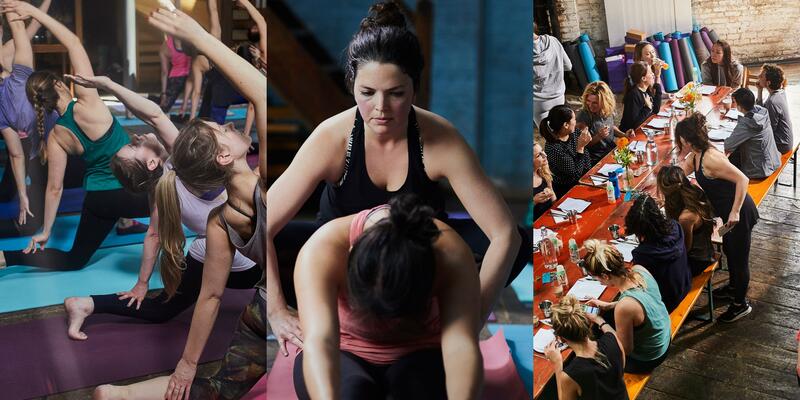 Other events happening around London this summer include yoga taught by Boys of Yoga’s Marc Hatvani at the ACE Hotel in Shoreditch followed by a rooftop brunch from the hotel’s restaurant, and the weeklyHIIT Weekend Brunch Club put on by WeTRAIN, a social fitness events company. Head further west and innovators in some U.S. cities are already on board the fit brunch bandwagon. Boston, in particular, appears to be leading the charge. Brunches of Boston, Boston’s largest brunch-specific review database, is hosting a series of “Brunch Fit” events this summer including an MMA workout followed by a meal at Battery Park, a barre class followed by eats at Post 390, and a yoga class followed by brunch at Blackmoor Kitchen. But if you don’t find an event by you, you can recreate the experience with a group of friends at home. Try this 20-minute yoga workout or this kickboxing routine. Better yet, invite 12 friends and do thisgroup soccer workout together. Then, whip up these Indian brunch recipes, courtesy of Manek. “When preparing for a yoga brunch, the key is really planning well,” says Manek. “If the dish has various elements, prep them all and label each box with the name and what needs to be done with it.” So if it’s the tofu scramble, make the tofu, cook the sweet potatoes, toss the kale and keep them all in different containers. “After your workout, just before everyone sits down, quickly toss those three things in a pan one after the other to heat them but also to give them a touch of freshness,” says Manek.